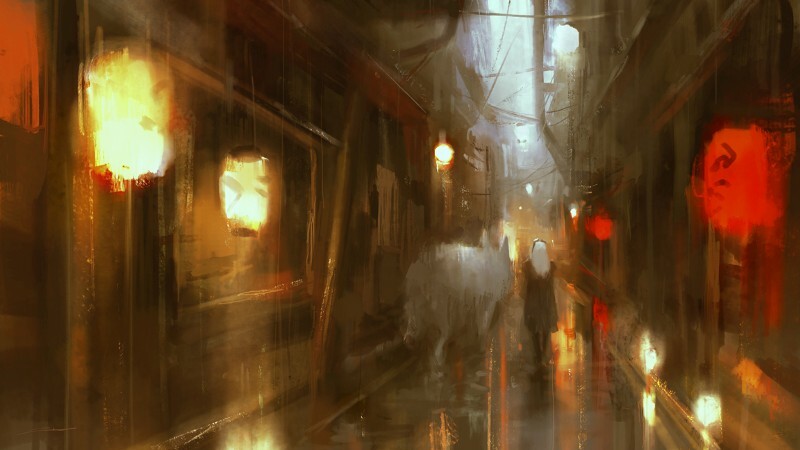 Alex Chow has a style that is certainly unique and definitely has had time to master his craft. In speaking with him he mentioned that Yoji Shinkawa, who is the art director for all the Kojima directed Metal Gear Solid games, one of his biggest inspirations. When heading over to his site, ArtofChow.com, you get an even greater sense on how he takes that inspiration and incorporates it into his style. Upon viewing, you notice that there are no definitive lines for the objects or structures in his art. Everything seems blurred and a little hazed as if trying to decipher an old memory. What helps is that you’re given key pieces of information to infer what the scene may look and feel to you. For example, in the picture above (Street of light red) you see blurred ovals of bright red colors and one of them has faint symbols; lanterns! You then see a figure of someone with long white hair walking next to something big, you notice the pointy ears, and four faint legs, a white wolf… Moro! They both look to be walking down this long industrial part of a city after a rainy evening. To someone else, that’s not moro, just a large white wolf walking alongside a girl. There are no lanterns but large red industrial lights and they’re walking through a bad part of town. This is what I love about Alex’s work. It is so fluid and versatile that you find yourself recalling old memories and emotions. The artwork rewards viewers by having them to utilize their imagination and feelings by recalling how one might of felt in a similar setting or on a particular day. One minute you’re looking at what seems to be a gloomy evening and the next you begin to feel that it may just be the dawn of a new day. It’s a style in which he perfectly applies to, “ The Queen of Blades” and one that lets my imagination run wild. We see what seems to be someone’s faint recollection, a memory that has been distorted due to immense trauma. A memory from an evacuee doing everything they could to get off a planet that was quickly being overrun by the Zerg and along the way had an unfortunate encounter with “The Queen” herself. This life changing and haunting encounter would have our evacuee thinking, “This is it…end of the line.” but instead the human side of Kerrigan spared this individuals life. The Queen of Blades would walk on by and continue on with her objective. After the brief encounter, this person would manage to get on a ship that, unlike the rest, would be the only one to make it off this planet. Bringing forth this art work from that frightful day. For Alex to pull an emotional feeling from me and enabling my imagination run wild to trigger those “light bulb” moments is a big feat for an artists. The fact that I was able to feel something is what inspired me to not only write about his art but to get in touch with him. How long have you been doing this and how did you find yourself getting into art? I’ve trained myself seriously as an artist for around 11 years. High school bored me to death as it was too easy, and video games started to take over my life for the wrong reasons. I got into art because it felt like a video game but far more productive. What inspired your art style? I always like doing things differently to some extent, for better or for worse. I wanted to incorporate what I liked in traditional techniques with the digital medium, and this type of stuff is the result of my experimentation. 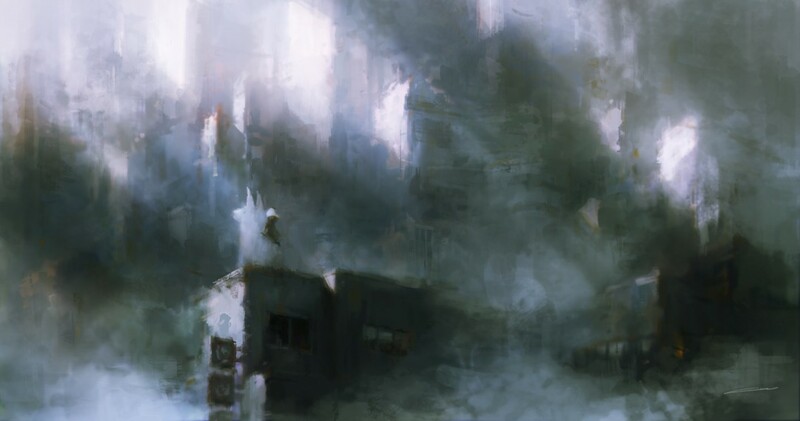 Some of my favourite artists utilize this type of aesthetic too such as Ashley Wood and Yoji Shinkawa (Metal Gear). 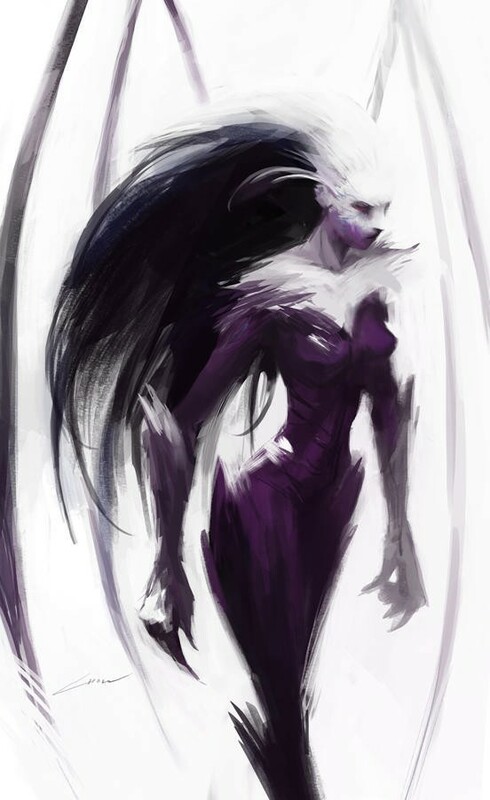 What inspired you to draw The Queen of Blades? While I can’t say I’m nearly as devoted to Starcraft 2 as I was with Brood War, I was always a big fan of Starcraft’s universe and Kerrigan is my favourite character from the franchise. Around the time, I was also testing out techniques and this type of look was something that clicked with Kerrigan. What was your approach and technique in getting your desired result? How long did it take you to make it? I just let loose and don’t care for what the result was. I finished the piece pretty quickly but given how sketchy it is, the quickness might have contributed to its aesthetics. Did you run into any problems or roadblocks in your process? If so, what were they and how did you overcome them? Drawing one character doesn’t tend to give me a problem in a lot of cases, as it’s a fairly simple composition. The biggest consideration was balancing its sketchiness with having a finished look. Sometimes I backtrack if something starts looking too rendered. If I wanted to become an artist or an illustrator such as yourself, how would I go about that? Train yourself as if it’s a serious craft. Most people do not take it seriously enough because the stereotype is to see it as a hobby that anybody could do. The reality is high-level art requires devotion just like any other industry. Always look to improve. To me this looks like Andariel from Diablo 2 rather than Karrigan. I think it's kind of cool how that style unintentionally did that. Yes, indeed. I liked the art itself as such and I gave it 5 stars because of all the effort behind it. I just pointed my opinion that it reminds me not of Karrigan but of Andariel. Karrigan is more green and darker and menacing and in the SC2 cinematics she had this feeling about her that I can only describe as "zergy" and nothing else. None of it is present when I look at this violet demonic looking chick here. So it's a good art but for me it fails to capture the essence of the transformed Karrigan. This is a good observation and valid point! I was trying to figure out why it didn't perform as well as my other posts on The Starcraft Observer Instagram account and now I know why. But Instagram is a bit tricky because it all comes down to the thumbnail too. It's great and amazing are nonetheless! great stuff! I got a new digital thingy. might start to play around with it here and there too.